Following on from the huge South Bay Waterfront development program covered in the last edition, Sino-Singapore Tianjin Eco-City has made headlines yet again and is to receive a further boost with a major environmentally friendly theme park. The announcement of the 2.86billion RMB Yi Li Ecological Theme Park comes as speculation was mounting over certain development sites in close vicinity to the South Bay Waterfront program. Hints had been dropped previously due to a pro-green lifestyle campaign being pushed by the local government. 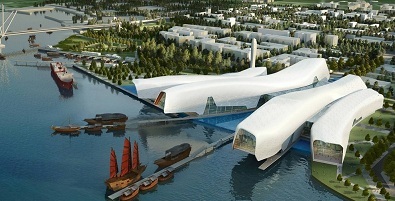 The theme park is expected to be the flagship for the go-green movement that these developments are expected to create. In conjunction with the South Bay Waterfront development these projects are also expected to kick start the ecotourism sector in Tianjin. The park will open up systematically, with the first opening in 2018, followed by a new section of the park every year until the final completion date in 2020. Getting people away from the hustle-bustle city life and helping people have the ability to reconnect with nature has topped recent agendas. Combating inner-city stresses and being able to provide open outdoor green space is key for the idea or concept of a modern city. The colossal 160-hectare theme park will consist of multiple venues and genres but all relate back to green life style in someway or form. Of the 160 hectares, 118 hectares will be devoted to lakes, inlets and wetland, whilst 42hectoares will consist of three islands and shore land. The first of the three islands will be host the ecological theme park and an education center aimed at promoting green life style awareness. The second island will be a recreational spot consisting of a children's adventure theme park and special areas for water enthusiasts to take to the lakes, intended to ignite interest in water sports and the great outdoors. The third island will be devoted to a spar and hot spring, primarily a with a getaway focus. The general goal of the project is intended to illustrate a new lifestyle to visitors, with the intention that it will make some sort of impact on their routine. In the world's second largest economy and with the worlds largest national population, encouraging a green and resourceful lifestyle is becoming a major issue. Wasteful consumer behavior may well spell further ecological disasters, which the country has been ridiculed on in the past decade. Who always tops the Olympic medal table? If you didn't know, it's China. However, if you look at a medal tables more closely, water sports isn't China's strong point. As a part of a new government plan to tackle this, watersports has received generous funding over the past few years. Furthermore, in relation to this, a whole range of ecological themed water parks has been designed up and down the country. China's rigorous Olympic training programs are renowned for their ability to deliver gold medal caliber athletes, yet the process of training these athletes starts a very young age. These new ecological themed parks, such as the South Bay Waterfront project are aimed at attracting, identifying and training a new generation of athletes to compete in major water sports such as rowing, sailing etc. This comes at a time where China has only recently taken similar efforts to mentor a new generation of football enthusiasts and stars. Countless infrastructure developments over the past few years have left major cities with state of the art footballing facilities and colossal stadiums. However, many of these stadiums suffer from low-mediocre attendance levels as well as poor quality football. A similar trend may well be expected for the future of watersports in China, but Rome wasn't built in a day. Tianjin development authorities have turned up the heat in the past 10 years and have been internationally recognized for it's zealous commitment to establishing a major green area in the region. This further 2.86billion RMB is another hefty price tag to stand with the rest. The rise of the Internet and telecommunications has left many alienated from the outdoors. The local government is keen to rectify this imbalance. Multiple schemes are sprouting across the global to tackle this, however none can rival the intensity and sheer scale of what China is doing. Ecotourism is now regarded as a serious emerging market aimed to bring balance back into the stresses of urban life. China is aiming to capitalize on its vast open spaces whilst utilizing its rich cultural and traditional heritage, which is closely bonded to aspects of nature. However, this isn't just for urban dwellers seeking a weekend retreat. The close proximity to the Binhai economic area (TEDA) represents a "Central Park" feel to the surrounding urban belt. The New Tianjin Eco-City Tourism Bureau associate investigator Zhang Kun has stated that the Yi Li Ecological Theme ParkÂ project will be a leading project for the New Binhai Area. "Yi Li Ecological Theme Park has the potential to be a catalyze to promote the emerging high-end Ecotourism sector. Tianjin and Binhai has significant potential to deliver many multilevel features to provide growing demand in this sector, especially for the urbanites of Beijing and Tianjin-Binhai". Furthermore, upon completion of the project, it is expected that the Yi Li Ecological Theme Park will become one of the primary image for Tianjinâs pitch in the international tourism market.